For almost 100 years, Girl Scouts has supported the power of a girl to make a difference in her community through the Gold Award project. The Girl Scout Gold Award is a prestigious honor and highest achievement in Girl Scouting. Girls are given the opportunity to engage with members of their communities to address an issue that they are passionate about. Tonight, Girl Scouts of Nassau County will honor 80 girls with the Gold Award and place them among an elite group of women who continue to make a difference in the world beyond the Girl Scout experience. Throughout the 2014-2015 Girl Scout year these girls dedicated their time to complete their projects while developing strong community leadership skills and spreading their voice to incite change locally and globally. These extraordinary girls are deserving of the Gold Award honor and we are proud of all their accomplishments throughout this journey. We hope this experience has inspired all our girls to continue to be passionate about their ideas and courageous to share them with their communities for years to come. 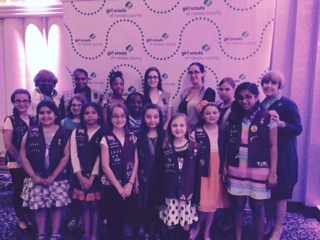 Congratulations to the 2015 Girl Scout Gold Award recipients from Nassau County! Megan B Emergency Preparedness"Are you Ready"
Katharine B "A Year of Giving"
Olivia C Be Fit! Be Healthy! Be Strong! Cheer! Julie K Don't "Bee" Afraid, Beelieve! Tatyanna S Is Your Pet Prepared? It was an amazing year for the Girl Scout Cookie Program in Nassau County – amazing events (were you at our Cookie Dunk or our Cookie Celebration? ), amazing new Cookies, and amazing weather (in a not so good way!) All of you who participated in the Cookie Program did a great job working on your 5 Leadership skills, earning funds for your Troop, and supporting Girl Scouts of Nassau County. Special congratulations to the awesome and amazing girls listed below, who were our Council’s top sellers. Troops in Nassau County earned over $640,000 in Troop Cookie Proceeds this year.... that’s a lot of fun-tastic experiences for girls and life-changing Take Action projects for our communities! Congratulations to all of our Robotic Teams!